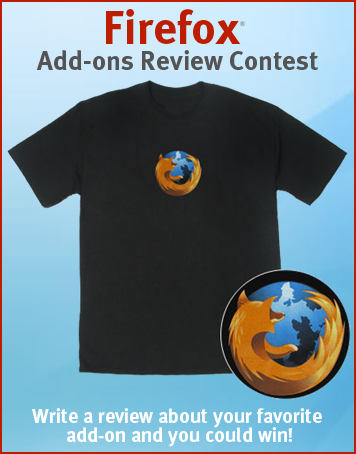 To help promote the use of add-ons for Firefox, we ran an add-ons reviewing contest for a period of two months, from February 9th, 2007 to April 9th, 2007. Prizes for the best reviews included a Firefox T-shirt, 24 USD of music downloads and a free domain name registration. Read the full details of the contest as published on SpreadFirefox.com: Firefox Add-ons Promotion Contest, Winner Selection Criteria, Winner Announcement. In total 168 reviews entered the contest, 112 reviews were in Spanish and 56 in English. One person even entered 75 reviews. The winning reviews were picked by a jury which consisted of: Ken Saunders, Jackie Liu, Marco Casteleijn and Otto de Voogd. Each jury member had the task of selecting the 10 best reviews and ordering them. The best review would get 10 points, the second best 9, etc... As there were 4 jury members the maximum points a review could get was 40. Mozilla Links for his review of Forum Additive. Vikas Sah for his review of Adblock Plus. Leandro Ardissone for his review of ScrapBook. The list of all the reviews that received points from the jury. See the full list of reviews that entered the contest and votes they received from the public.